The time for European Agriculture to make a choice: why should we believe in the CAP? The Common Agricultural Policy has been subject to in depth reform over the last fifteen years and has continued to be the focus of severe criticism. The most recent reform in 2003 which made "decoupling" widespread, ie attributing independent aid to farmers – decoupled from production - planned for a "Health Check" in 2008. At the heart of the debate is a major financial issue: in 20 years Europe has dedicated 1000 billion euros - updated euros - to the CAP. The CAP is still the main budgetary line in the EU's annual budget with 53 billion euros in 2008, all expenditure together ie 41% of the budget – a burden that is supposed to be a handicap preventing the Union from turning towards better adapted expenditure in the face of the challenges of the world economy. But apart from this recurrent criticism the CAP is the victim of more subtle problems. The original CAP regulated the agricultural markets whilst the present one is above all an income aid for farmers: the CAP is becoming less and less a policy, less and less agricultural and less and less common. The CAP barely has any sense or goal any more. Moreover whilst all reforms over the last fifteen years were supposed to bring prices down and to eradicate all risks of over production, prices have never risen so much and the threat of a food crisis has re-emerged. Hence the CAP is criticised by those who reformed it and the reforms have barely been successful. So what should be done? The Health Check either helps to slightly correct the measures introduced four years ago, or it also provides an opportunity to think at length about the problems which are undermining it. The CAP is still justified primarily for reasons of principle since it is the only truly communautarised policy: decided upon by 27 members and applied by the 27 members. It is the only common policy and may be the only one there ever will be. A truly common policy supposes such great relinquishment of sovereignty that there will always be a State that will be reticent in crossing the line to sign another policy. This also includes anything to do with research, so artificially compared to the CAP: the agricultural sector is almost entirely funded by the EU whilst the latter only intervenes as a back-up to European research. It is therefore perfectly logical that the CAP funds are way above those granted to European research! The continuation of a dynamic CAP supposes however some conditions. 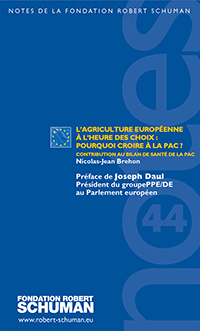 Above all coherence has to be found again: the CAP has to be an agricultural policy. The extreme dependency of farmers on European subsidies is humiliating and destined for failure. The CAP has been turned far too much into a social assistant to continue long term. Farmers have to win back their dignity and the CAP its credibility. Socially or environmentally oriented subsidies to the rural world (subsidies of the second pillar) are useful but divert the CAP from its initial and fundamental target:agriculture. This agricultural policy must be directed towards Europeans' food security. The Union should maintain some policy and budgetary tools including stock management instruments, a good means to level out price rises and also guaranteed prices offering a good rate of return according to the American model of marketing loans. But if the CAP is refocused like this it is also bound to receive public approval again. This vital link is starting to become strained. In order to rebuild this social link the CAP will first have to rid itself of its contradictory links to environmental issues, the Achilles Heel of modern agriculture. It will then have to become part of Europeans' daily life by making food, notably fruits and vegetables, the main focus of its interventions. European failure can often be attributed to a supposed lack of attention paid to the concerns of European citizens. When the food issue is made a priority a new enhanced European Agricultural and Food Policy will certainly gain to rise to the challenge.